New Hampshire’s incumbent Democratic Senator Jeanne Shaheen was laughed at by the audience at the New Hampshire Senate Debate on Tuesday when she would not give a clear answer on whether she approved of the job President Obama is doing. That is completely false – think the federal budget. Liberals are always calling on conservatives to “compromise” on budget matters, but the budget is a simple yes or no question: do you increase spending or do you not increase spending? A little increase is not a compromise – it means more spending. This tone of arrogant intellectual superiority is so typical of liberals like Shaheen – who would like voters to think that everything can be compromised and there are no “right answers” to any questions. But here’s the real key point in the debate. As Breitbart reported, "Shaheen was then asked how she could reconcile voting with the president 99% of the time and President Obama’s low approval rating in New Hampshire. She stated 'I work for New Hampshire. And Scott Brown talks a lot about one survey and 99% of the time that I voted with the president,' before talking about her record getting a prison in New Hampshire opened, her work with residents who were facing foreclosure, and language she added to a veterans’ reform bill with Senator Kelly Ayotte (R-NH)." Notice that Shaheen’s answer was intended to make the campaign all about local issues – getting “free stuff” from the federal government to bribe the voters of New Hampshire into keeping her, and Democrats like her, in office. 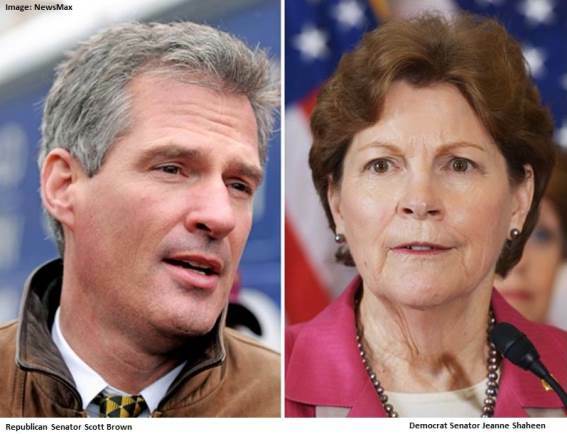 Scott Brown then proceeded to nail Shaheen by bringing the debate back to national issues: amnesty and immigration, national security and Obama’s abuse of power. Brown’s underdog campaign has surged because Brown has nationalized the election by campaigning on immigration and other national issues. Other Republican candidates who were underperforming and have now gotten back in the game, notably North Carolina GOP Senate candidate Thom Tillis, have done the same thing and found the voters responded. We all know there are different kinds of laughter – the “belly laugh” you get from a comedy like Talladega Nights; the laugh that comes from the recognition of a clever play on words; and the laugh of derision that comes when you catch someone in a lie. To keep the laughter going all the way to Election Day the GOP leadership must nationalize the election on the issues of amnesty, national security and Obama’s abuse of power and then keep asking the same question that brought down the house in New Hampshire: Do you approve of the job President Obama is doing? FedUp PAC has launched an effort to nationalize the election. To learn how to help go to "Nine simple things you can do TODAY to influence the 2014 election and save America."